WASHINGTON -- Now that America has had its holiday from politics, we can get back to poking one another in the eye, and otherwise breaking the rules of decorum for the ladies and gentlemen of public life. Our holiday from politics was occasioned by the death of George Herbert Walker Bush, as fine a gent as has entered public life in decades. Every testimonial delivered to him last week was deserved, save one. That was a petty line from the eulogy delivered by historian Jon Meacham. It was just one lapse into pettiness, but it deserves to be reckoned with, for it demonstrates just how poisonous ideological politics is today. Meacham disfigured the historic record to advance his ideological point of view, as I shall demonstrate to you shortly. President Bush was one great figure and a great guy. I first encountered him when he was head of the CIA, just one of many of his calls to serve his country. At any rate, he was head of the CIA during another of our intelligence community's episodic scandals, or at least so-called scandals. This scandal involved the CIA's involvement with the affairs of private enterprise, namely the agency's clandestine funding of political magazines and authors writing books on current affairs. A friend of mine had invited such writers as Bill Safire, Bill Buckley and me to a dinner at New York's Union League Club, where Bush was supposed to put our minds at ease as to the CIA's illicit collusion in our work. Bush was earnest, ethical and quite frank as he attempted to assure us of the agency's new policy. It would have no clandestine involvement with publishing whatsoever. Each one of us was allowed a question or two. As all the magazines and authors that had been exposed theretofore were on the left, I merely asked that the CIA continue with its munificence and be sure to include magazines on the right, too. George assumed I was in jest. It was the beginning of a long and friendly relationship. We had a friend in common, Vic Gold, a memorable character and sage political advisor. We exchanged notes, often provoked by Gold. I have the former president's epistles from Camp David and the White House in my office to this day. There was the time he spoke at an American Spectator gala. He was seated next to me and, as was typical of him, kept in pretty constant contact with his Secret Service detail. At some point, I turned to him and said, "Mr. Vice President, you didn't need those guys tonight." And I pointed to a table of tough-looking thugs. Startled, he asked who they might be. I told him they were nothing more dangerous than my handball buddies. He laughed and told me he preferred his Secret Service detail and, I think, squash. During his four years spent as president, he was always friendly. Some conservatives took exception to his openings to the left, but he believed in collegiality. I did not think it would work, but I always trusted his good intentions. Who knows, maybe the Democrats would trust his good intentions, too. In the spring of 1990, he had me to luncheon at the White House -- in the Rose Garden, if memory serves -- with Charlie Black, a very savvy political strategist, and John Sununu, Bush's chief of staff. He was concerned about what now seems like a measly budget deficit of $2.8 trillion. As I recall, everyone at the table told him not to raise taxes. Apparently, he doubted us, and soon he did raise taxes. It was the end of his presidency. A very good man, a World War II hero, gave way in the next election to Bill Clinton, a proven draft dodger. It was the end of an era. 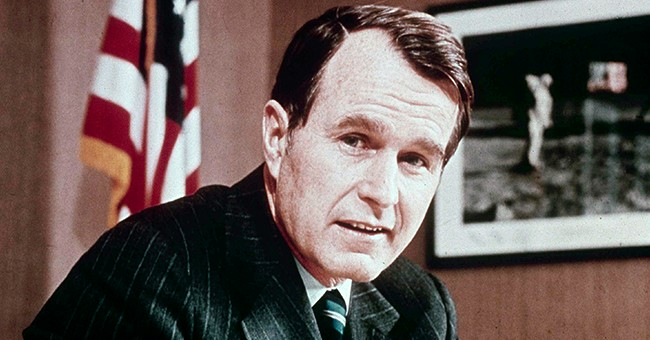 Last week, historian Jon Meacham eulogized: "George Herbert Walker Bush was America's last great soldier-statesman, a 20th-century founding father. He governed with virtues that most closely resemble those of Washington and of Adams, of TR and of FDR, of Truman and of Eisenhower, of men who believed in causes larger than themselves." Meacham stopped short of President Ronald Reagan. And, by the way, he left off his list Abraham Lincoln, and he added Adams somewhat incongruously -- John Adams, I presume. Why would a historian ignore Ronald Reagan? President Reagan led as momentous a revolution as FDR did. Both men changed the way government did things. Reagan effected significant changes in both foreign policy and domestic policy, as did FDR. I, an American conservative, can recognize the momentous presidencies of FDR and Reagan, though I fully approve of Reagan and approve less so of Roosevelt. Why cannot Meacham?